Last week the Dechen sangha was blessed by the visit of H.E. 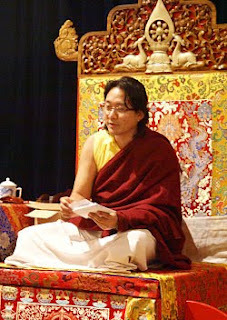 Gyana Vajra Rinpoche, younger son of H.H. Sakya Trizin. 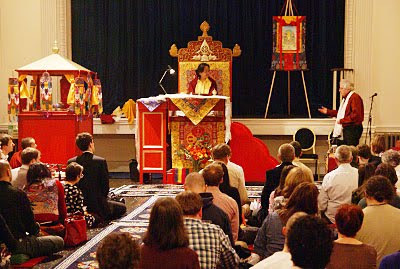 Rinpoche previously visited England in 2002, when he accompanied His Holiness on His Holiness’s teaching tour; however, Rinpoche's visit last week marked the first time he had given teachings to the Dechen sangha in England. Rinpoche was accompanied on this visit by Lama Tenzin, a Sakyapa monk currently resident in Australia. Rinpoche gave two initiations in Bristol: Guru Rinpoche, from the treasure cycle of Dudjom Rinpoche; and Sanjay Menla, transmitted by the great Abbot Shantarakshita. On the Thursday evening Rinpoche gave the initiation of Manjushri Arapatsana in London. At the end of Rinpoche’s visit he thanked Lama Jampa Thaye and commented on how impressive he had found the Dechen centres and sangha. Lama Jampa, in turn, thanked Rinpoche for blessing the Dechen sangha and prayed for his long life. This auspicious visit by H.E. Gyana Vajra Rinpoche presages the visit of his father, His Holiness Sakya Trizin, in June 2010 to bestow the initiation of Kalachakra upon the Dechen sangha.